TaylorMade M3: The new TaylorMade M3 driver is packed with brand new technology to create "a game-improvement driver played by the best players in the World". Lofts: 8.5°, 9.5°, 10.5° & 12° (440 (RH only) in 9° & 10°); LH in 9.5° and 10.5°. Shafts: Tensei CK Red (high launch), Blue (mid launch) or White (low launch) shafts in R, S & X flexes. The new TaylorMade M3 driver is their most adjustable driver yet, and guaranteed to grab all the headlines surrounding this product in 2018 is their brand new face technology: Twist Face. By twisting the face and updating the bulge and roll concept, TaylorMade have created a new face concept which aims to minimise off-centre hits and allows you to hit to straighter, longer shots thanks to a larger sweet spot. Yet Twist Face isn't the only new technology packed in to the M3. Moving on from the outgoing M1, the new TaylorMade M3 driver also has a “Hammerhead” face slot to protect ball speed and drop unwanted spin, a Y-shaped weight track to help personalise the driver and better aerodynamics with a 5-layer carbon crown, along with a new silver top edge on the crown and a +/- 2 degree loft sleeve. 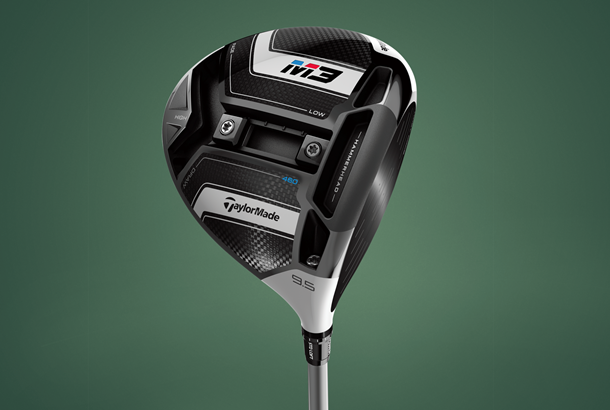 Read below to find out everything you need to know about TaylorMade's new M3 driver. Twist Face tech is said to tighten dispersion by up to 11 yards. 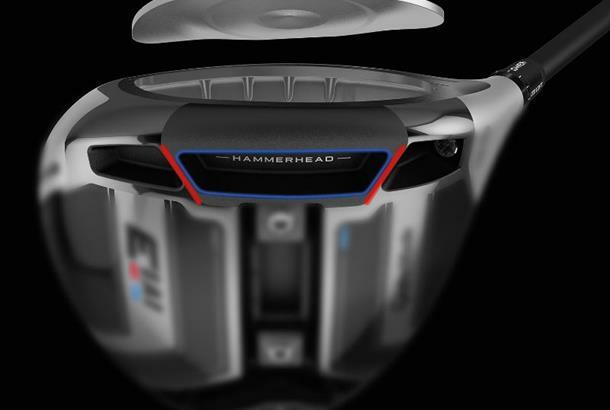 Hammerhead slot in the sole reinforces the outer portion of the face, meaning it's lighter and more flexible. Y-Track can lower/increase spin, increase forgiveness and/or influence shot shape bias. Everything you need to know about driver shaft weight. And why it's now more important than flex. Next to an M3, original M1 looks positively agricultural! A carbon crown and two carbon-fibre sole sections mean the M3's a serious feat of engineering. More so than any driver we've tested before the effect of repositioning the sole weights has a bigger impact on ball speed, back spin and carry distance. It means finding the right set-up is crucial. Our pro recorded his longest average carry (274 yards) and his longest single shot (282) with the M3, even though ball speed was a couple of mph slower than the fastest on test. His longest shot came 8mm from the toe and 12mm high on the face, without the sole weights being positioned for max forgiveness; proof how stable and efficient the M3's slightly smaller footprint (compared to M4) really is. 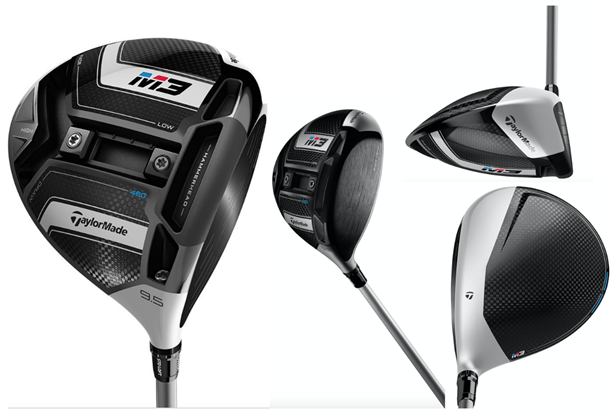 The M3's ability to let decent players dial in launch, trajectory, back spin and forgiveness is unparalleled. At £110 more than an M4, you'll really need to use the adjustability to warrant the cost though. It's not just for brilliant golfers, TG Ed Chris Jones was a huge fan; even though he pebble dashed shots across the face. 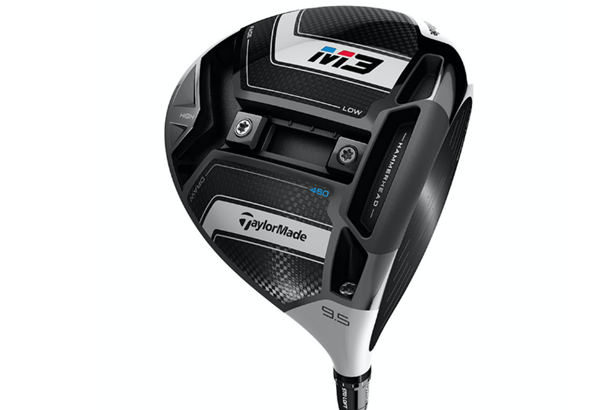 The new TaylorMade M3 Driver uses the brands new innovative face design technology 'Twist Face', which in its simplest form has been created to achieve longer, straighter shots for the golfer. By looking at data and analysing what the golfer does, TaylorMade found the most-common miss-hits were low-heel or high-toe shots, but that the bulge-and-roll concept used in previous drivers wasn't rectifying this in the proper way. As a result, Twist-Face was born to correct the ball-flight on those miss-hits, allowing for straighter, and therefore longer, shots. 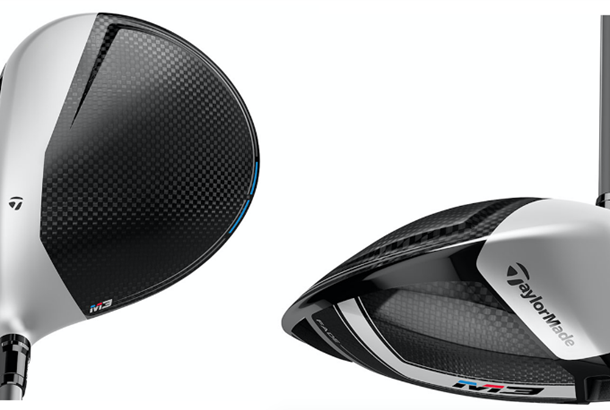 Both the TaylorMade M3 and M4 drivers have Twist Face technology, where the high toe has been ‘twisted’ open and the low heel closed with less loft to help correct face angles for golfers biggest misses. Brian Bazzel, VP of Product Design, said: "Ultimately what you’re trying to do is counteract what’s happening in the head and the effect that’s created. With Twist-Face, you’re going to go from 14 yards from low heel to high toe to essentially 3 yards. We talk about game changing innovations… this is where it’s at." "We twisted the toe back to add a little bit more loft to get it to go a little bit less left. On average that shot is finishing left of target, so you need it to be slightly more open. Same thing on the low heel; we’re trying to kill some of the spin so we de-lofted it (the heel) a bit more and we’re trying to get it to go less right so we bring it back, close it a little bit more and twist that face so we counteract the shots the golfers are doing, not what a robot would do"
The Hammerhead slot on the new TaylorMade M3 Driver was engineered to work in combination with Twist Face and Inverted Cone technology to deliver maximum ball speed across a larger area of the face. By dividing the Speed Pocket into zones, TaylorMade was able to increase its overall length by 22% - from 82mm to 100mm. Additionally, it allowed for the creation of a larger flexible centre zone, designed to increase ball speed on low face impacts and drop unwanted backspin. By using new ribs at either end of the slot, engineers have decreased the thickness and weight allowing for a more flexible face. Brian Bazzel, VP of Product Design, said: "A slot design or a speed pocket helped us create ball speed but it also let us drop the spin that was created with those designs so we could get high launch and low spin. 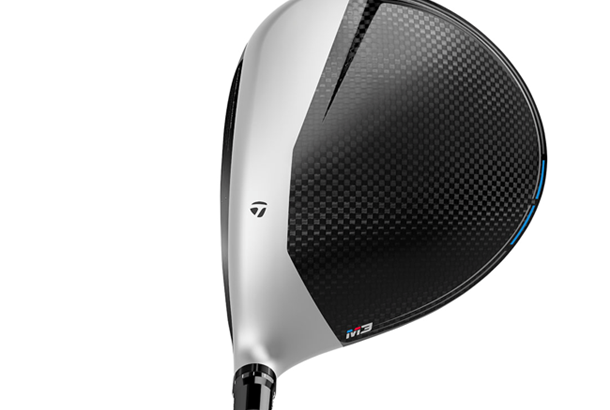 This is one of the competitive advantages of TaylorMade drivers and fairway woods." "How the Hammerhead became different is that we used the centre section, we lengthened that slot and we used the centre section much like a speed pocket. Where it is different is by creating more stability on the heel and toe, we’re able to make the face 20% thinner, and lighter." "By doing that you create you get more flexibility, especially high on the face on high heel or high toe, so we’re trying to expand the sweet-spot. Right now we’ve been up against the USGA, R&A limit as it relates to ball CT, and now we’re trying to expand that to as large an area as possible." Only used on the TaylorMade M3 460cc and 440cc drivers, the new Y-Track adjustability system allows all 22g (two 11g weights) of mass to be used for both the benefit of shot bias control, as well as front to back CG adjustment. The Y-Track gives more precise CG adjustability than ever before (and an 83% increase in MOI over M1 with both weights at the back of the head) with more than 1,000 unique set-up positions — more than double the number in the 2017 TaylorMade M1 driver. Brian Bazzel, VP of Product Design, said: "The original M1 was the first time we had a front-to-back track, where we were able to move 2.2mm of CG. The new M3, we’ve been able to move the mass three times more than the original M1, almost twice todays M1. In experiences we’ve had with our tour players, with our sales associates, it is incredibly easy to fit this product because of this Y-Track." "This is a game-improvement driver played by the best players in the World because the inertia is high. When you put the weights all the way back and split them, you get higher inertia both heel to toe (5000) and high to low. Back in the old days you’d have to make a really odd shaped driver to do that, but now you get that forgiveness in our most adjustable product." This is the thinnest, strongest and lightest composite crown ever seen on a new TaylorMade driver. The crown on the TaylorMade M3 driver is made from five layers of carbon fibre (down from seven on the M1), and it helps absorb vibration improving sound and frees up every last gram of inefficient weight. There is also a new silver colour which replaces the white from both the 2016 and 2017 version the M1 and M2 drivers, which TaylorMade have put in their new M3 driver to make sure you can tell the difference between the old and new products. Brian Bazzel said: "There’s more carbon fibre, aerodynamics in the crown and then the 12 position loft sleeve, +/- 2 degrees. With the matte silver, we definitely wanted it to scream I’m new. Secondly we know that the contrast between the face and the crown have an effect on performance so we wanted to make sure we still had that." "We have no doubt that when you put it on the ground when you’re with your playing partner we’ll know who has the new one and who has the old one." Brian Bazzel, VP of Product Design, said: "It is still workable, but it does have a little less side spin on off centre shots. Proving it out with some of these best players was our first step which was complete validation. When we were with this group and Rory came to me and said ‘I’ve been thinking about this twist face; my miss is low heel – is it really going to have the ball flight that I’m expecting? Will it have that expected slight curve to it?’ and I said yes lets go test it." "His gamer – he hit his M2 which he loves 4mm on the heel and it went 6 yards right, it was a nice shot. He hit an M3 8mm on the heel and it went 3 yards right. It went half the distance off line, he hit it twice as much off centre and it still had the same curve to it. At that point he was sold." Keith Sbarbaro, TaylorMade’s VP of Tour Operations said of fitting DJ: “It was a pretty easy start. We know where Dustin needs to start for loft and everything, so step one is to get the launch and spin correct (180mph, 2000rpm, 11°. We’re looking at around 2000rpm for his low spin rate and 2300rpm for his high spin shots. “We started in a standard loft and it was a little spinny, so I took the two weights and moved them forwards to take the spin off, it came down from 2500 to 2200.